Rob Lowe is no longer playing lesser, cable-cursed versions of himself to for DirecTV. But he does star in a spate of fun new promos for Fox NFL Sunday, his brand of choice for watching football. Both now and in the future. Potentially as a hologram. In another spot, Lowe activates a hologram of 69-year-old New York Giants coach Tom Coughlin. After admiring his distinct look, Lowe wonders how he'll look at that age, then conjures up a hologram of himself—gray along the temples and seductively simpering in a bomber jacket that brings to mind Top Gun (in other words, he'll look better than Coughlin, probably because Lowe's job is to be pretty and charming … and Coughlin's job is to yell at football players all day long). In short, the more absurd the spots get, the better they are. (Hank Perlman at Hungry Man directed the series.) Lowe's musings on the maximum altitude of eagles is a particular highlight. 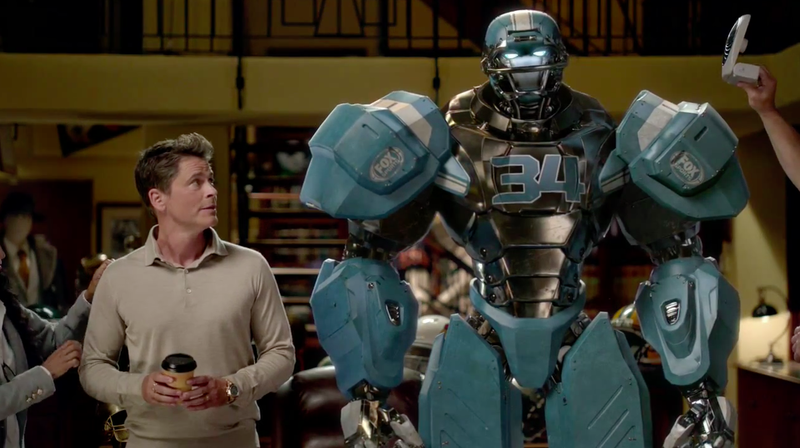 Other clips include nods to the Cowboys and Fox Sports' robot mascot Cleatus, who will presumably outlast Coughlin and Lowe both, barring excess exposure to salt. Not coincidentally, Lowe also stars in the new Fox comedy The Grinder, which premiered Tuesday. Ads: "Eagles Jets," "Sleep," "Theme Music"